The most commonly used dermal fillers today are based on hyaluronic acid, which is a naturally present substance in the human body. It is most densely concentrated in the vitreous body of the eye and the joints. Hyaluronic acid used for medical and cosmetic purposes is produced in sterile conditions, using laboratory grown microorganisms. There are several types of hyaluronic acid, each of which has different indications: skin rehydration, smoothing deep wrinkles, lip augmentation and face contouring. Once a cosmetic dental treatment, usually a smile makeover, has been conducted, patients often opt for an additional procedure that would complete their new and improved appearance. The results of injecting dermal fillers are visible immediately – deep wrinkles vanish, and the lips appear fuller and younger. The Skinbooster is used for skin rehydration. It can be applied in patients as young as 25-30 and it is used to restore the smoothness and glow of aging skin. This light-consistency hyaluronic acid product is applied into the surface layer of the skin via microinjection. How Does the Skinbooster Work? Why is it Different from Other Fillers? The Skinbooster (Restylane Vital or Vital Light) is a light hyaluronic acid, virtually liquid in texture, whose function is superficial smoothing of the skin. It is different than other, denser fillers, used for filling wrinkles or face contouring. The Skinbooster has biochemical characteristics that enable cohesion of water molecules in our skin and stimulate collagen production. Hyaluronic acid is a naturally present substance which makes our skin full, smooth and a youthful. However, during the aging process, the skin loses collagen, elastane and hyaluronic acid, becoming dry, rough, wrinkled and less elastic. If you are looking for an anti-aging effect, always choose Skinbooster. What are the Advantages of the Skinbooster? The Skinbooster is terrific for improving the overall appearance of the skin: it reduces acne scars, smooths out the skin, eliminates fine and softens deep lines, and rehydrates the skin, leaving it firm and radiant. Why is the Skinbooster Treatment so Superior? It is a treatment that provides each patient with glowing, healthy-looking skin and improves their overall appearance dramatically. The Restylane Skinbooster is most commonly applied in the area of the face and neck. It can also be microinjected into the chest and the back of hands for rejuvenation and rehydration. How is the Skinbooster Applied? The most common method of administering the Skinbooster is microinjection – light, superficial injection using a fine needle, conducted by an educated doctor. The Skinbooster may also be applied with a dermaroller or a mesotherapy gun, which allows the simultaneous treatment of a larger area of the skin. What Does an Ideal Treatment Plan Look Like? The best results are achieved by repeating the treatment for 3 times within a month. This leaves the skin saturated with hyaluronic acid, which stimulates collagen production and slows down the process of skin aging. In order to maintain the levels of hyaluronic acid in the skin, a single session should be performed after 6 months. The standard dose for treating the entire area of the face is 2 mL, while the combined face and neck treatment usually requires 3 mL. The number of mL affects the price, which can sometimes surpass 4.000 HRK per treatment. Which are the Possible Side Effects? The injection site may bruise or slightly swell (which can last for up to 1h). All swelling should subside within 24h. In most cases, the patient may return to his or her daily activities immediately. However, if you plan on freshening up your appearance for a certain event, try to schedule your treatment at least 1 month in advance. During the two days prior and following the treatment, you should avoid taking medications based on acetylsalicylic acid (Aspirin, Andol, etc.) and blood-thinners (vitamin E, garlic, ginseng) – they can stimulate subcutaneous bleeding and bruising. Steer clear of activities such as swimming, sauna, sunbathing and extensive workouts within 24h after the treatment. Botox is a purified natural protein synthetized by the Clostridium Botulinum bacterium, and it has been used in medicine for decades. This non-surgical esthetic procedure is the most popular and efficient method of smoothing unwanted lines of the upper third of the face. After applying a topical anesthetic, Botox is injected into the treated area using a very fine syringe. It blocks the pathways between nerve signals and facial muscles. The results of Botox treatment are visible within 7-14 days and can last up to 6 months. The patient should schedule a checkup 2 weeks after the treatment for the doctor to examine the full effects of Botox. The substance breaks down after 6 months and the treatment should be repeated. Continuous application prevents muscle “building” and line enhancement, which is why Botox can also be seen as a prevention to line formation. It is not recommended for patients younger than 25, nor pregnant or breastfeeding patients. 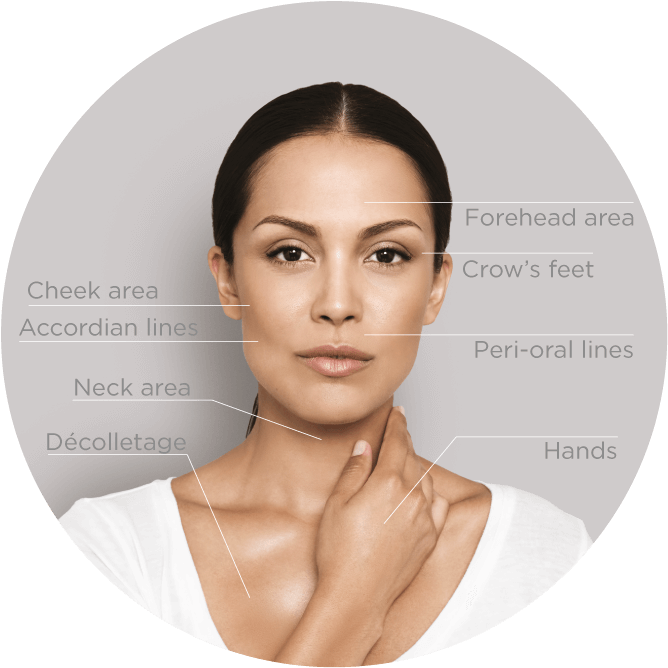 The most commonly treated areas include the region between the eyebrows (“Number 11 Lines”), the forehead (horizontal lines) and the area around the eyes (“Crow’s Feet”). In these regions, Botox is superior to any filler treatment. In the field of dentistry, Botox may be used to treat bruxism and gummy smile. Small doses of the product relax hyperactive muscles, indirectly protecting the teeth from excessive wear and improving the patient’s smile! Side effects may include drooping eyelids or eyebrows, as well as temporary sight impairment. All side effects should subside within weeks and no permanent damage is possible. Though unpleasant, these side effects are extremely rare. Sanja Vuić Private Dental Practice uses Vistabel. The price of the treatment is formed according to the situation and the treated area, that is, the number of Botox units used. The price of a single unit is 50 HRK. For instance, the price of forehead and number 11 lines treatment usually amounts to 2.000 HRK. The procedure is quick and slight pain is present only during injection. Lip augmentation is a procedure of injecting hyaluronic acid fillers into the area of the lips in order to enhance their volume and make them more harmonious with the rest of the face. Aging causes the loss of facial muscle tone and the thinning of subcutaneous fat, which leaves our lips thinner and more wrinkled, giving our faces cheerless or strict expressions. Even a minimal lip augmentation can make a face look significantly younger. By applying the Restylane Kysse hyaluronic filler, lips can be made wonderfully full and soft. They can also be contoured to perfection using Restylane Lyps. Sanja Vuic Private Dental Practice uses hyaluronic acid-based products, which employ the advanced “cross-linked” technology to provide your face with a more youthful appearance. The range of products is related to each indication individually, from skin rehydration and smoothing lines, to lip augmentation.